I’m a HUGE fan of Google Earth. Ever since the terribly buggy and laggy days of its first incarnations, I’ve used the resources provided by it, oogled monumental structures from space, and found ways to encourage teachers to use it more in their classroom. Sometimes I get pushback from teachers wanting a resource that’s more accessible to students, doesn’t require the internet, and will always be there even if the power goes out (I believe they call these things maps, and they’re printed on paper). Other times I get teachers looking for ways to provide the sort of visuals that wouldn’t be possible with any form of conventional maps, and love all of the layers and information that the infinitely extensible Google Earth can provide. Whichever is the case, I find that if I’m not actually teaching, I forget about how amazingly and ridiculously awesome Google Earth is, which is a shame. So it was with great delight that I found a really cool tool via the Google Earth Blog that encouraged me to dig through some of my past links for Google Earth resources. The result was a great trip down memory lane, exploring resources both beloved and lost, and uncovering new gems that are providing me lots of excuses to once again share Google Earth’s resources with the teachers in my building. I thought I’d lay out a few here to see if anyone else discovers (or rediscovers) something that might help rejuvenate your interest in Google Earth. 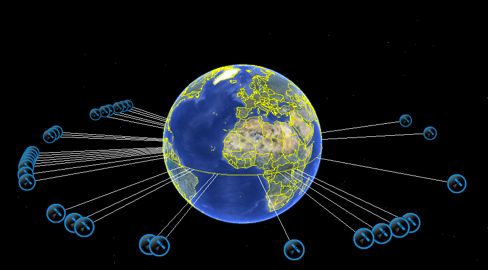 Coming from the Google Earth Blog, this really great Google Earth browser plugin tool lets you check out all of the “geo-stationary” orbits of several of SES’s satellites. Besides being a fantastic excuse to pretend you’re a character from Star Trek and use the word geo-stationary, it’s a great way to help students understand how far out satellites are, what they’re communicating with on the ground, and the importance of “line of sight” transmission. Check out the SES Satellite Fleet here. 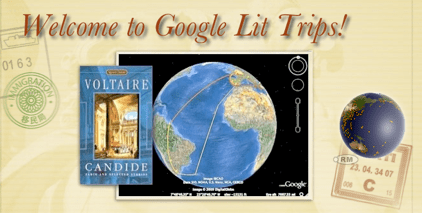 Google Lit Trips is an oldie, but goodie! Imagine taking one of your favorite “journey” novels (Watsons go to Birmingham, Candide, Walk Two Moons, etc.) and embedding the discussion guide within Google Earth! You and your students can follow the journey taken by the characters in the book, talk about the setting with contextual imagery and street views, and include all sorts of opportunities to bring Social Studies content into literature discussions! Check out Google Lit Trips here! Ancient Rome in Google Earth! I am a total ancient history nut, so when you find a resource that shows you over 6,000 historical 3D buildings from the ancient city of Rome, I get really geeked. Interiors, high detail, and lots of other historical information is shared through this giant Google Earth map. Make sure you’re running a recently new machine to handle all of this content. Check out Ancient Rome in Google Earth here! It's a global game of hide and seek! Imagine playing Marco Polo or Hide and Seek on a global scale! Now mix in Google Earth so it doesn’t take several hours of plane travel, and you’ve got PlaceSpotting. It’ an awesome way to help students practice basic map skills, including latitude and longitude reading. The concept is pretty simple; you’re given an undisclosed location in Google Earth, and then you have to find it, using the clues provided. Once you feel like you’ve successfully located the “hidden” spot, you can check your answer to see if you’re right. Send “geo-hunt” quizzes to friends, or create your own, it’s like having you own mini version of Amazing Race! 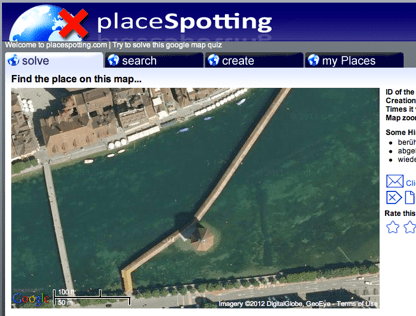 Check out PlaceSpotting here! I could go on and on with all of the amazing resources shared on the web that tap into the power of Google’s virtual globe software, and the ways you could use them in the classroom, but the point is that it’s quite often a great idea to come back and revisit a resource or piece of software that you haven’t used in awhile, because you’ll never know how it might surprise you when given a fresh look. There’s more than enough here to get me fired up and putting together some Google Earth sessions for my teachers at our annual “tech camp” this summer, and perhaps go on a Google Earth binge into the next school year. And that right there is just another awesome reason why Google Earth is amazing. The ability to contextualize news and other current events, and then mixing it up with other content from the web. I watched, and was fascinated by all of the different points you made about the unfortunate event and the media coverage afterwards. Have you seen the Amazon River in Street View? I did see that the other day, looked awesome, and was entirely appropriate that they followed up with street view for railroads at important UNESCO sites. Thanks for the post, excellent use of Google Earth. The hide and seek game is an excellent resource and useof thelearning aspect of the tool. I enjoyed the Ancient Rome post having been an Ancient History major. Any other neet little tools?